It helps to walk in someone else’s shoes—even the dust-covered shoes of a remodeling client. As a former contractor, I’ve generated my share of dust tearing out plaster, sawing and drilling concrete, and sanding joint compound. But I had always done most of the remodeling at our home in Vermont (which is contractor-code for saying that the house was in a constant state of renovation). I was never on the other side of the plastic, so to speak, until circumstances conspired to make me the client on two remodeling projects about two years apart. The first came when an editorial job moved me to Washington, D.C. I needed to wrap up some small unfinished projects in the Vermont house and start a major new one: replacing siding and about a dozen windows. I didn’t have time to do the work (and frankly, it was more than I could take on), so I hired a young craftsman on the recommendation of a friend. He worked alone in a well-organized, methodical way. He fabricated as much of the work as he could in his shop—cutting, assembling, and painting extension jambs, for example—and despite being new to fiber-cement siding, he quickly learned to use nibblers to keep the dust down. He worked both inside and outside of the house and although we knew when he was there, the disruption to our lives was minimal. Fast forward two years to the installation of a central air system in the 1927 row house we purchased in the Columbia Heights neighborhood of Washington. 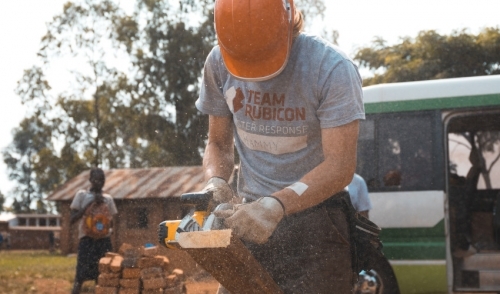 On the first day of the job, a two-man crew had spent the day cutting into plaster, brick, and wood to locate about a dozen supply and return registers. Upon arriving home from work that evening, I was greeted by one of the crew, who wanted to show me what a good job they had done making the cuts without chipping the surrounding brick or plaster. But I had a tough time concentrating on what he was showing me because of all the dust. It was everywhere: a light coating on floors and walls; a gray layer along the built-up baseboard moldings and window and door heads; a fuzzy blanket on open shelves and inside cabinets. In one room I noticed a fan near an open window, aimed at the dust-plugged screen. When I asked about it, he explained that they had used the fan (my fan) to push the dusty air outside. Now we all know that sealing a fan in a window opening creates negative pressure and pulls dusty air to the outside. But placing a fan near an open window creates a vortex that propels the dust everywhere but out the window. Weeks after the job had been completed, I found dust inside a closet in the guest bedroom next to the room where the fan had been placed. What was in the dust? Take your pick from the table below. 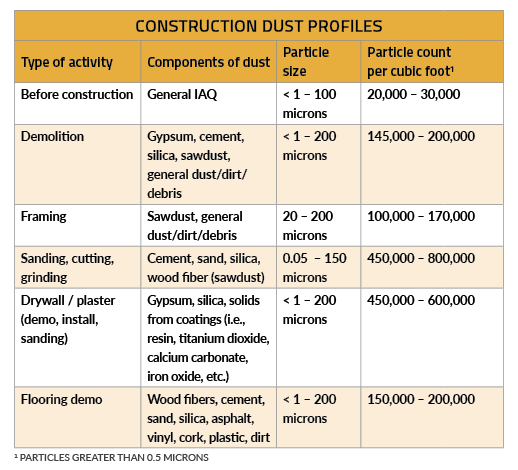 Lots of people think that OSHA’s new silica rule applies mainly to commercial work, and technically that may be true. But stories like mine are more the rule than the exception, and that’s reason enough in a marketplace of health-conscious homeowners with access to online rating sites to pay attention to how much dust you make, what’s in it, and where it goes. In the chart above, to determine the number of particles generated by more than one activity occurring simultaneously, add together the readings from all activities. It’s too late for the maskless dust factory of an HVAC crew who breathed in their noxious work-product all day, but there’s still time to make a difference on your next job. Making dust is inevitable, but spreading it around is preventable, and lots of remodelers are very close to achieving dust-free remodeling. For everybody else, if the shoe fits, dust it off and wear it. That goes for the respirator, too.